The legacy of betrayal of the blessed land of Palestine by successive secular Egyptian governments is well-documented. However, today, under the murderous dictator and lap-dog of the US, Abdel Fattah el-Sisi, this treachery has reached another level. According to Nathan Thrall, a Jerusalem-based senior analyst for the International Crisis Group (ICG), a research NGO, “Egyptian-Israeli relations are today at their highest level in history.” It is a point re-affirmed by many political analysts in the region who have stated that the Egyptian state and the Jewish occupiers are experiencing the closest cooperation in decades, especially in the security and military arena, including against armed groups in Gaza and Egypt’s Sinai desert. The media outlet Bloomberg, even reported that ‘Israel’ carried out drone strikes in Sinai with the Egyptian government’s consent. The criminal collusion of Egyptian authorities with the terrorist Jewish entity, under the leadership of el-Sisi, in suffocating the Muslims of Gaza by aiding the Jewish siege of the strip through the imposition of the crippling blockade of the Rafah crossing, hence preventing our Muslim brothers and sisters of Gaza access to basic needs such as fuel, foodstuffs and medicines and from seeking medical treatment, as well as the cooperation of the Egyptian regime with the brutal occupiers in destroying the vast Palestinian built tunnel network, is also well-known. According to Bloomberg, the two governments are also close to securing a new multimillion-dollar gas deal. And in May 2016, the el-Sisi government introduced the textbook, ‘The Geography of the Arab World and the History of Modern Egypt’ to Egyptian schools which contained more inclusive and friendlier language towards ‘Israel’ and increased emphasis on peace with the murderous occupying entity. The book also condensed the history of conflict with the Jewish body from 32 pages down to 12 pages. Alongside this, Egyptian 9th grade students are now required to memorize the provisions of the 1979 Israel-Egypt peace treaty. As we know, such criminal betrayal of Palestine is not only the legacy of successive secular Egyptian governments, but all rulers and regimes of the Muslim world since the destruction of the Khilafah. While playing lip service to the importance of Al-Quds and this blessed land, these despicable Muslim governments have been aiding the Jewish entity to strengthen its occupation of Palestine. Indeed, they have served as ‘Israel’s’ greatest asset and defence force! For example, just days before Trump’s announcement, Saudi Crown Prince, Mohammed bin Salman had reportedly privately urged Palestinian President Mahmoud Abbas to accept a vision of statehood without a capital in East Jerusalem. 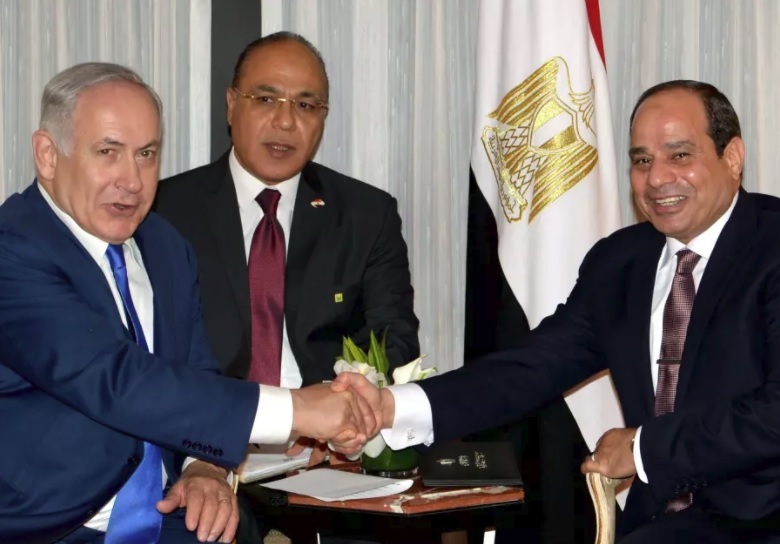 Indeed, in September 2017, ‘Israel’s’ leader Netanyahu, stated at a gathering in the Foreign Ministry, that the Jewish entity is enjoying a greater level of cooperation today with the Arab states than it has ever had in its history. Surely, it is way past time that as an Ummah we put an end to the rule of these treacherous Muslim regimes and establish with urgency the Khilafah (Caliphate) based upon the method of the Prophethood which will liberate this blessed land once and for all and return it under the glorious shade of Islamic rule, making Al-Quds the capital of the state of the Believers!